304 p., 16 ill., 14,7 x 20,8 cm. With contributions by Thierry Bokanowski, Friedrich-Wilhelm Eickhoff, Gerhard Fichtner, Raul Hartke, James M. Herzog, Rolf Klüwer, Lydia Marinelli, Paul Parin, Horst-Eberhard Richter, David Rosenfeld and Marcelo N. Viñar. 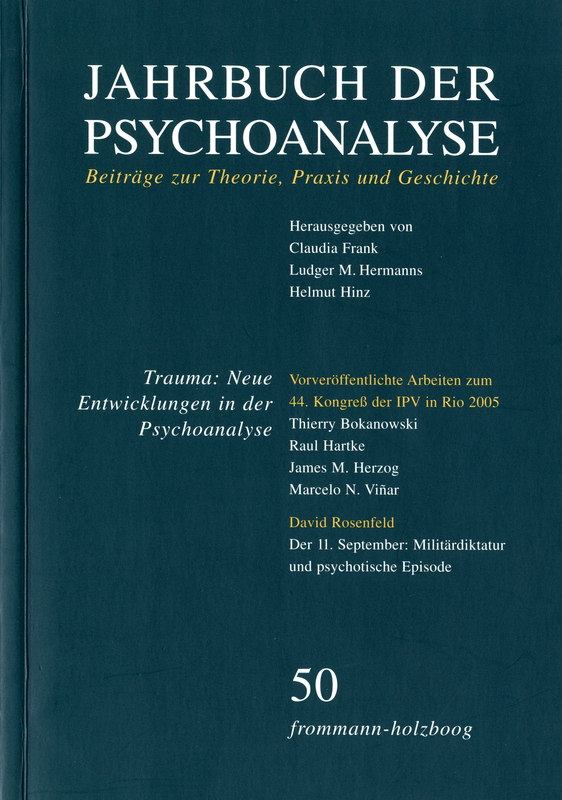 In this paper, the author outlines Freud’s fundamental hypotheses concerning the concept of traumatism, then goes on to differentiate three notions: traumatism, traumatic (in a substantive sense) and trauma. These three terms correspond to the three turning points in Freud’s theory with respect to the concept of traumatism (1895-1897, 1920 and 1938). The author evokes also the developments that are due to Ferenczi, particularly in his later writings (1928-1933), where he defined and discussed the question of trauma in contemporary clinical practice; the paper goes on to explore the different »variations« on this theme as regards mental functioning. The author then defines, from a metapsychological point of view, the differences between traumatisms that have been worked over by secondary processes, organized and governed by the pleasure-unpleasure principle (»traumatism«) and early or primary traumatisms, which interfere with the process of binding the instinctual drives (»trauma«); states of mind influenced by a traumatic imprint (»traumatic«) are looked upon as belonging to both categories of more developed traumatisms. A clinical example illustrates the author’s hypotheses. The author attempts to develop a concept of psychic trauma which would comply with the nucleus of this Freudian notion, that is, an excess of excitations that cannot be processed by the mental apparatus, but which would also consider the functions and the crucial role of objects in the constitution of the psychism and in traumatic conditions, as well as taking into account the methodological positioning according to which the analytical relationship is the sole possible locus of observation, inference and intervention by the psychoanalyst. He considers as a basic or minimal traumatic psychoanalytical situation that in which a magnitude or quality of emotions exceeds the capacity for containment of the psychoanalytical pair, to the point of generating a period or area of dementalisation in the psyche of one or both of the participants, of requiring analytical work on the matter and promoting a significant positive or negative change in the relationship. Availing himself of Bion’s theory about the alpha function and the metapsychological conceptions of Freud and Green concerning psychic representations, he presents two theoretical formulations relating to this traumatic situation, using them according to the »altered focus« model proposed by Bion. He presents three clinical examples to illustrate the concept and the relevant theoretical formulations. In this presentation, the analysis of a precocious traumatized little girl reveals the ways in which historical trauma is transmitted and intra-familial trauma is both disguised and represented. The play as it evolves is seen to simultaneously communicate what the child struggles with and to resolutely try to hide what has actually happened. Analyst and child together participate in play which utilizes displacement, enactment and interactive enactment; the latter play mode being the very hallmark of profound traumatic experience. Carlotta, the child, helps the analyst to follow her quest for meaning making even as the interaction between them adheres to and departs from the deepening pentimenti of traumatic experience which needs to be unraveled and reconstructed in order that her own developmental progression can be rejoined. The analysis facilitates Carlotta’s capacity to play in a more unfettered fashion and to assist her family’s recovery as well. The author attempts to situate the specificity of torture – understood as the product of political violence and of totalitarian state – within the historical framework of the concept of trauma in psychoanalysis. When the mind and social ties are simultaneously affected, the intrapsychic and transpersonal aspects of the suffered damage intertwine in a complex and unique web. The author aims to dismantle the notion of victim, considering it both stigmatizing and inaccurate. The goal is not just to identify the after-effects and the disabilities suffered by those affected by torture, but also to integrate their experiences and their narratives into a life project. Rather than individual psychopathology, this essay reflects upon those phenomena of suggestion and hypnosis that are at work in human groups under ordinary conditions and that are exacerbated under social crises, following the Freudian axis developed in Group psychology and the analysis of the ego. The author discusses the challenge a professional psychoanalyst faces in treating a patient who went through atrocious experiences during a period of his childhood and adolescence. He describes the clinical history of a young man age 23, who starts his treatment with the author after leaving the hospital after a psychotic episode. When he was 18 months old, his parents were kidnapped from his home by military personnel, and the child was left in the care of a neighbor. The parents were then taken by the miltary to clandestine centers for detention and torture. His childhood and family history, told in a confused, disordered way, sometimes enacted in the session without words, led the author to work basically with two models of investigation. The first is the mechanism of »encapsulated autism«, which preserves healthy infantile aspects of the mind. The second, the severe massive traumata that can make introjections disappear. The author discusses only some of the methodological problems and theoretical models clinically, because of limited space. Not all the theories are exemplified or illustrated clinically. The author refers to a historical event that took place on september 11th, 1973, the day the coup d`etat in Chile begins, when Pinochet orders the attack and aerial bombardment of the presidential palace, assassinating President Salvador Allende (elected in free elections) and his Cabinet members. This is the other story. The Dutch graphic artist M. C. Escher, whom we all know as the creator of impressing pictures, was never sure whether he should ascribe himself more to the artists or to the discoverers. Although he was well known all over the world he found more acknowledgement by natural scientists like mathematicians and physicians than by fellow artists. They valued his pictures, because he was able to visualize connections in his pictures, which had not been seen by natural scientists before. The author tries in his article to relate some of Escher’s pictures with inner reality as it was conceptualized in psychoanalysis. He transfers Escher’s central interest in the structure of area and space and their relationship to the psychic world. He tries to show how we re-find the discoveries represented in these pictures in the psychic world. Thus connections can be visualized with Escher’s help, which are well known and appear new at the same time. Es handelt sich wie immer um eine aufregende Lektüre mit hoher Aktualität.